Study rooms and carrels, computers and printing, copying and scanning. The U.S. Green Building Council's LEED® green building program is the preeminent program for the design, construction, maintenance and operations of high-performance green buildings. Learn more at usgbc.org/LEED. 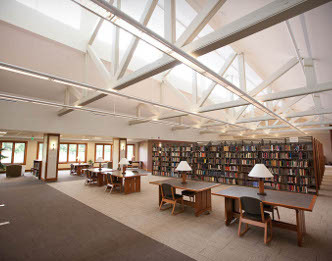 AMBS Library was the first LEED-certified theological library. In 2009, our building achieved LEED Gold®, the second-highest level of green building certification, for the variety of environmental features that were incorporated into the construction. The result is an incredibly beautiful and sustainable research environment for our students, faculty, and broader community. 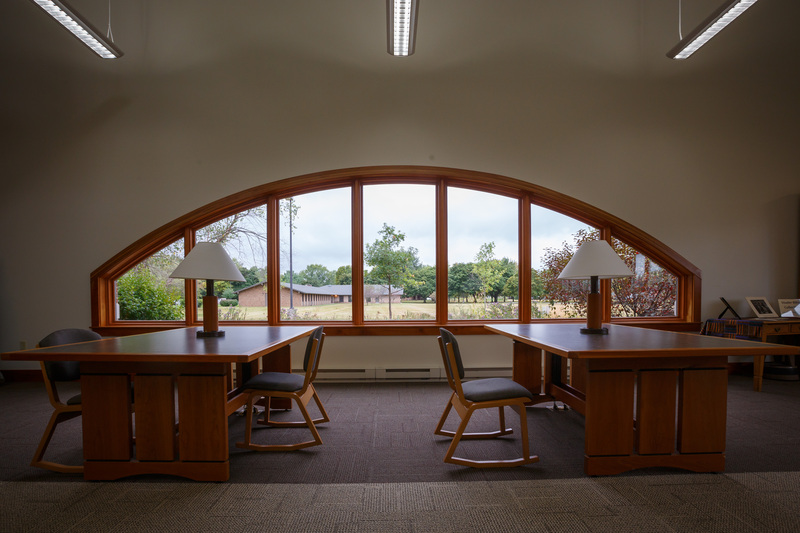 In addition to the specific green features, the library has large study carrels that AMBS students reserve on a semester basis, a variety of seating arrangements, and ample space for library collections. Of special note is the cherry trim and paneling harvested from local trees and milled by our late retired Director of Maintenance, Don Steider. Eileen Saner, retired Director of Library Services, put special care into planning and designing a facility that would match AMBS’ values of creation care and serve researchers well. President Emeritus Nelson Kraybill led the drive to raise funds from AMBS supporters so that the construction and ongoing maintenance of the facility would be fully funded. The numerous contributors to the construction and the Next Generation campaign are honored with books carved on a cherry panel in the Library Gallery.